Teamwork between gamma-ray and radio astronomers has produced a breakthrough in finding natural cosmic tools needed to make the first direct detections of the long-elusive gravitational waves predicted by Albert Einstein nearly a century ago. An orbiting gamma-ray telescope has pointed radio astronomers to specific locations in the sky where they can discover new millisecond pulsars. Millisecond pulsars, rapidly-spinning superdense neutron stars, can serve as extremely precise and stable natural clocks. Astronomers hope to detect gravitational waves by measuring tiny changes in the pulsars' rotation caused by the passage of the gravitational waves. To do this, they need a multitude of millisecond pulsars dispersed widely throughout the sky. However, nearly three decades after the discovery of the first millisecond pulsar, only about 150 of them had been found, some 90 of those clumped tightly in globular star clusters and thus unusable for detecting gravitational waves. The problem was that millisecond pulsars could only be discovered through arduous, computing-intensive searches of small portions of sky. "We've probably found far less than one percent of the millisecond pulsars in the Milky Way Galaxy," said Scott Ransom of the National Radio Astronomy Observatory (NRAO). The breakthrough came when an instrument aboard NASA's Fermi Gamma-Ray Space Telescope began surveying the sky in 2008. This instrument located hundreds of gamma-ray-emitting objects throughout our Galaxy, and astronomers suspected many of these could be millisecond pulsars. Paul Ray of the Naval Research Laboratory initiated an international collaboration to use radio telescopes to confirm the identity of these objects as millisecond pulsars. "The data from Fermi were like a buried-treasure map," Ransom said. "Using our radio telescopes to study the objects located by Fermi, we found 17 millisecond pulsars in three months. Large-scale searches had taken 10-15 years to find that many," Ransom exclaimed. "Fermi showed us where to look." "This is a huge help in our effort to use millisecond pulsars to detect gravitational waves," Ransom said. The more such pulsars scientists can find and observe over time, the more likely they are to detect gravitational waves, he explained. He said that astronomers now have barely enough millisecond pulsars to make a convincing gravitational-wave detection. "With Fermi guiding the way, though, we can change that picture quickly," Ray said. "We've just started to follow up on the objects located by Fermi, and have many more to go, with a great success rate so far," he added. 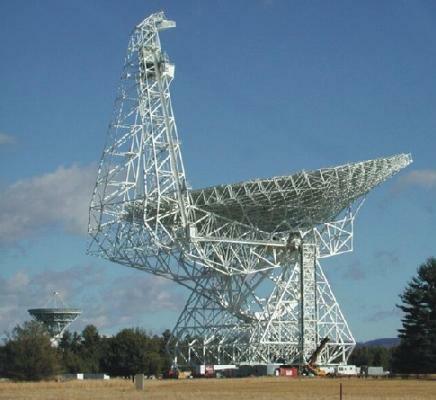 Ransom, along with his colleague Mallory Roberts of Eureka Scientific, used the National Science Foundation's Robert C. Byrd Green Bank Telescope (GBT) to find eight of the 17 new pulsars. The scientists announced their discoveries at the American Astronomical Society's meeting in Washington, DC. Pulsars are neutron stars -- the dense cores left after a massive star has exploded as a supernova. About as large as a medium-sized city, these neutron stars have strong magnetic fields that channel lighthouse-like beams of radio waves that sweep through space as the star rotates. When such a beam strikes the Earth, radio telescopes can detect the strong radio waves. As they age, pulsars slow their rotation rates. However, if the pulsar is part of a binary-star system and can draw in material from its companion, its rotation can be sped up. When the neutron star has been sped up to rotate hundreds of times a second, it is called a millisecond pulsar. In addition to helping scientists detect gravitational waves, study of millisecond pulars also can yield important new information about other effects of General Relativity and about fundamental particle physics. "This new ability to find many more millisecond pulsars really is a treasure chest that can yield many valuable gems of scientific discovery," Ransom said.